Hello and welcome to the first day of the Otley Walking Festival and welcome to the Otley Psychogeographical Sound Walk. If you are curious and have no idea what that means, I’ll tell you about it before we head off! Basically we are going to be walking reasonably quietly around the town actively listening with our ears at the sounds that we can hear in the environment around us. Wherever we go we will give our ears priority rather than our eyes. So welcome to Otley! I think this would be a new way for you to experience and get to know the town. We will walk around the town, and have a half way stop in Wharfemeadows Park for an ice cream or a cuppa tea. Then walk a different route back and finish somewhere in the center. So the format of the walk is that I will lead the walk and you will walk alongside or behind me. At certain lengths, like for example, walking through the busy market we will walk in single file, but at other times, it can form whatever form you want. Make sure you keep up. I don’t walk fast, but sometimes people can dawdle. We have a back marker? The role of the back marker is to ensure that people don’t fall behind them, and that you know where you are walking. Give phone number to back marker. The back marker will wear a flourescent jacket like myself and it makes it much easy for me to glance back and see them and know that the group is within me and them. It helps for you too as walkers only need to think about if they are in the middle of me and the back marker. Basically when you are walking you don’t need to worry about where you are going, so you are free to just listen. As we walk, I want you to try not to talk, but only talk about the sounds. We will stop occasionally and talk about what we have just heard and what we can hear. Remember that when you talk, others on the walk will hear you and that may affect the walk they are on. We can talk more about this now and during the break and afterwards. I’ll tell you more about this rule later anyhow. Now, at times I will stop and then I encourage you to all crowd around me, this is so that we dont get in any others way, and also to ensure that you are all hearing the same things. After a 2 or 3 minutes in silence we can talk about the sounds we hear. So no chatting and the only thing we can talk about are what we listen to (or cannot hear). When we are stopped we can talk more freely about the sounds. If you encounter a friend, just say “Im on a quiet walk, I cant talk now”, and another thing to fight against is the nervous silences when we feel tempted to break the silence. A walking group that doesnt make much sound is a bit of a silly thing both for other people to see and for us doing it. In a way by participating in the walk you are doing psychogeography as you would never have used this space in this way before. When we stop at the cafe we can natter and talk about anything then! I’ll also pass around the raffle tickets as this is a free event and the festival relies on raffles and your donations to survive. there are also some great prizes to win! Some other rules – as we walk around we will need to cross roads. I will stop before crossing and you will catch up and we will form a group and cross as that group. Please use your own judgement when crossing roads, dont cross them blindly, and watch out for traffic. So if new people turn up you know, please tell them these rules! There are a few steps here and there and some paths if wet might be slippery. There is a short park field will will walk across but you can walk around that bit if you cant make that. This is basically psychology (the mind) and geography (places and spaces). So we are doing something that relates to our mind and perceptions and the specific space (otley) and general spaces (how we walk about and experience places in general). For example, you know that walking in a town is different than walking in the country! Psychogeograpyy as a term is vague though and has a few other definitions. The term was mainly coined by a group of leftist students, sorry I mean Intellectual Artists, in Paris in the 50s and 60s called the Situationists. They saw Psychogeography as a tool to expose the captialist machinery of the city – but they didn’t really give any ideas as to what it should be replaced with nor any tools on how to do the replacing (apart from marxism and revolution). One of the things they did was observe people as they walked around, and they saw a map of a girls students movements around Paris in a year. It was a simple triangle of routes- From home to university, and once a week to her piano teacher. They were appalled that someone so young should live such a constrained way in such a great and varied city. Of course you can interpret the girls life in many other ways, many of them positive and not one of alienation. Psychogeography can be considered a practice of using space and being in a place in a different way so that you are not doing things the way that it’s set up for. By doing it you can in a sense break out of the rules of the game. Psychogeography can tell you about a specific place, about how we use and experience spaces in general and about ourselves and how we feel in different places and our own behaviours. A Sound walk is where you walk around listening to sounds in your environment. soundwalking is “… any excursion whose main purpose is listening to the environment. It is exposing our ears to every sound around us no matter where we are.” Wherever we go we will give our ears priority Sound artists can think about a sound walk as a type of composition. Our speed of walking, the sounds and route we take could be considered a musical score in a way. There are many sounds around us, and many things that you cannot hear! Some ambient sounds are inaudible or filtered out by our brain. Like the wind, or a road traffic hum. Some sounds are characteristic, landmarks or soundmarks of a place. Some sounds are clear signals – a dog barking, an alarm clock etc. The sound carries the meanining. Some sounds are out of sight and unknown. Some sounds you can see. Nature has a whole catalogue of sounds. Now if you are thinking “thats easy, hearing stuff is easy” then you can consider how sounds change when you are 1) walking through a place 2) bouncing and reflecting off different materials 3) combined and overlaid with other sounds 4) the volume of a sound and the pitch of a sound. Truely actively listening can be tiring. But I want this walk to be interesting, so dont worry too much. Just give your ears priority! I’m not an expert and expect some of you to hear and notice things I cannot. You can help concentrate on the sounds by not looking around so much – so if the way is clear, looking down instead of around might help, but thats optional. Lets do a bit of a practice. Here we are outside courthouse. What can you hear? I’ll give you the first one free, you can hear me talk! Easy. Now. Lets just close our eyes for a few seconds. I’ll tell you when we can open then. And try to list all the different sounds you can hear. Okay go. Lead your ears away from your own sounds and listen to the sounds nearby. What do you hear? Other people Nature sounds Mechanical sounds. How many continuous sounds? Can you detect: Interesting rhythms, Regular beats, The highest, The lowest pitch? Okay lets begin the walk. The walk itself was good, and varied I think. Walkers noted how doing it sharpened every other sense too – even seeing. It was like meditation – mindfullness. That the surface where they walked on, stones, cobbles, grass, tarmac all become more noticeable. Drones from air conditioning units became more apparent – as well as how the sound of wind in trees in a way masked out lots of sound. One walker wondered if you could identify different trees based on the sound of wind in them. Bird song also becaome apparent. In parts, traffic sound become almost intolerable. 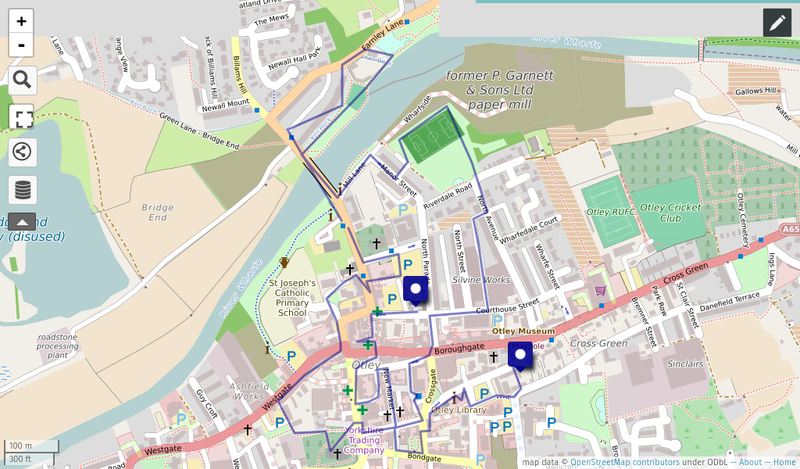 The route, roughly shown here in the map, took us from the centre through the busy Saturday market, and through the busy shopping streets, through the bus station, and to Sinclairs / Silvine Works factory. At each of these locations we stopped for a few minutes in silence and had a listen and then had a chat about what we heard and could hear at that spot. Then we wandered towards the river, through a park and into Tittiebottle Park and over the bridge, along the river where we passed another large group of walkers who were preparing for their walk to Farnley Hall. past the Bowls club which were playing a game, clack, and then the spectaclular weir. Then to the park proper and the ice cream stop for the break. After that we walked back to town, through a pub, into a church and through the centre again. For next time I think I would end at the Park by the river. A few people ended at this spot, and on the second half, I was getting tired (we were also walking up hill). So the route for next time will be different.